Nigerian actress, Tonto Dikeh who recently changed her son's surname from Churchill to Dikeh. Her reason is that her son thinks his father is dead. 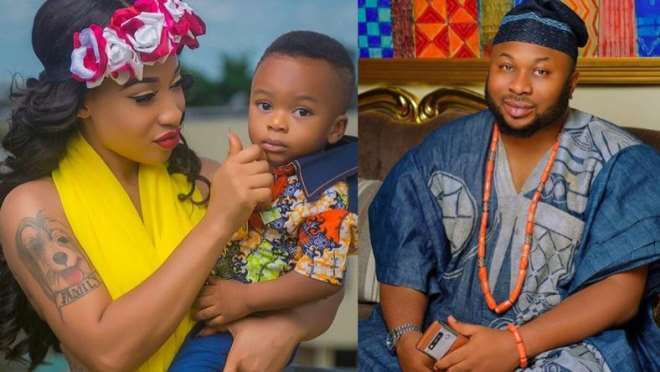 Tonto's comments comes received backlash from fans after she disclosed that she has renamed her son as “King Adre Dikeh” with the excuse that her ex-husband, Olakunle Churchill, who fathered her child has been a deadbeat dad. An anonymous account on social media has chastised the controversial Nigerian actress for taking such an “attention seeking” decision to defame her estranged husband upon all the good things he did for her. These comments got Tonto Dikeh angry as she went on a social media rampage with series of post attacking her son's father with unprintable descriptions. She also labelled him as a fraudster, bisexual and a gigalo. An Instagram user reminded the actress that no matter how she tags Churchill, the fact still remains that his blood flows in her son. This she replied saying “the fact remains he thinks the father is dead”.